An important part of playing poker is obviously the cards you hold in your hand. Some poker hands look very pretty and enticing but are actually hands that should be played with caution as they are very easy to get yourself into trouble with and lose money. Overplaying these hands certainly will NOT make you a winning player. Of course there are many ways to win at poker besides showing down the best hand, but often times, having the best helps. This is especially true at lower limit games where a hand goes to showdown more often. Having a solid foundation of starting hands is be one of the first key steps to becoming a better poker player. Poker Hands that Look Good but are… NOT! This article will help to shed light on many hands that have better looks, than quality of rank. Many beginners and inexperienced players fall into the same traps with these hands. They see the pretty hand, get excited about it, but fail to realise that actually these hands are not that strong compared to many other hands that your opponent is likely to be holding. They then find it hard to throw the hand away and end up losing a lot of money. To keep this as simple as we can, we will look at 4 groups of hands that you MUST act with caution with. The hands within the groups can be classed as the same when it comes to value and how they are miss-interpreted value wise. 1. Ace – Rag… Ooooh an Ace! “Any Ace will do” is what I like to say when it comes to some players. They look down and see a lone Ace in their hand and immediately feel it is worth a bet or call. However, Ace-rag will be one of the worse hands you can play in many situations. For those who don’t know, “Ace rag” is a poker term for a starting hand that contain a single Ace with the other card being a low card for example A-7 or A-5. I would say anything lower than a 9 should be classed as “Ace-Rag” although some others would argue that even A-10 or A-J should be included. The biggest mistake people make with Ace-rag hands is calling a raise with them. Just think about it for a moment… If an opponent has raised there is a higher chance that he holds a strong hand. A lot of those strong hands he might have will be a stronger Ace, such as A-K or A-Q. In these situations you will be dominated with your Ace rendered pretty much useless as even if you hit an Ace, your opponent will still have a better hand than you due to the higher kicker card he holds. Your odds of winning the hand in this sort of situation is severely reduced and most of the time you will be in a world of pain and end up losing money. Suppose you call a raise from an early position player. The flop brings an Ace, giving you top pair. However, you have a weak kicker and still don’t know if your hand is best. You are unsure if you can bet for value or if you have the worse hand, making your decision difficult. This is where the problem lies with these types of hands. You never know what to do with them, even when you hit the card you were hoping for. You are giving yourself difficult decisions to make, and that is totally the wrong thing to do, you should always be aiming to make your opponent make all the difficult decisions and make your decisions as straight forward as possible, transferring the opportunity for mistakes to your opponent. In this situation it’s very difficult to extract value from your top pair as you may be out-kicked or your opponent will probably fold because they have nothing. More often than not, you will call down to the river only to find your opponent holding a better Ace. Repeat this process over and over, next thing you know, you’re broke. 2. Pocket Jacks – Wow a High Pair! … or is it? This is likely to be one of the most overvalued hands in poker. It does have showdown value and it is a stronger than average hand. However, its strength is always misinterpreted and is over played far too often. A player looks down and gets all excited when they see two Jacks… “finally I have a big pocket pair”… after all Jacks are a picture card and I have two of them! Well actually Jacks are on the borderline between being classed as a middle pair and a high pair, and personally I like to treat them as a middle pair because they are so easily beaten by anyone who holds an Ace, King or Queen in their hand. 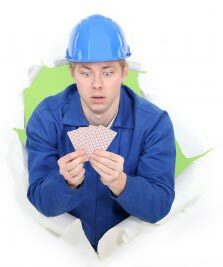 I’m not saying that Jacks are not a strong hand because they are and have some value, but most of the time Jacks will be miss-played before the flop. Players will happily re-raise to a player who has already raised, and are happy to throw their money into the pot or move all in with their pretty Jacks. I’m not saying that you should never go all in when you have pocket Jacks, and certainly there are situations (especially in tournaments) where this may be a good move, but if you do this on a regular basis, you will surely become a losing player. It’s rare to get it in with Jacks and be a strong favourite. The best case you will probably run into is finding your opponent holding AK or AQ under your opponent’s hand. Even then, your only a very slight favourite with a pair of Jacks. This will only happen about a quarter of the time you go all in with Jacks pre-flop. The other 3 times your likely way behind against a player with a higher pair and will lose most of those times. The best way to play Jacks, is to act with caution. Call and take a flop and use your skills on the flop, turn and river to make the best decision. Don’t over play them and get carried away and always be prepared to throw them away if the action is getting too heated or overcards come on the flop. 3. Suited Cards – I’m going to make a Flush! Another common misplayed group of hands are those that have suited value. For many players it doesn’t matter what the cards are, as long as they are suited, they will be good enough. The harsh reality is that you will only hit a flush roughly 1 in 4 times while holding 2 cards of the same suit, and even then you may not have the strongest hand if an opponent is holding a higher flush. The rest of the time, you will end up folding and losing precious chips. To compound this mistake, many times you will hit a flush draw on the flop and it will cost you much more than your initial pre flop bet/call to call down and see all the cards to the river only to miss your flush and lose even more money. You also open yourself up to making mistakes, for example when you have a hand such as K-3 suited, you may find yourself in a situation where you hit top pair. Many players cannot fold top pair no matter what happens on the board and will naively lose even more money when they are out kicked or beaten by a better hand. So hopefully you can see there are many pitfalls that come from playing any 2 suited cards. 4. Connectors – I’m going to make a Straight! Another common set of hands that players love to get the money in with are connecting cards. These are hands such as 9-8, 8-7, 5-4 etc. These are acceptable hands to play in certain situations, but they are still quite a long shot to win as you are looking to make a straight or some other strong hand with them. On their own they are worthless and just making a single pair is unlikely to put you in a strong position to win the hand. This is why Connector cards lack any real value when played heads up against a single opponent. You really want to play these hands against multiple opponents so that there is more money in the pot to compensate you for the longer odds that you will actually hit the straight, so you are getting a better risk reward ratio. These types of hands have no showdown value, unless you hit your straight or unless you can successfully bluff with them, they will be long term losing hands. Their only true value lies in making a straight or possibly 2 pair. The upside to these hands is that when you do hit your straight then you will often get paid off quite handsomely by your opponents. You’re such a spoil sport! I’m not trying to spoil your fun, just advising you to be cautious with the above groups of hands. A lot of the time you should just cut them out of your game completely, but other times, you should be playing them, but acting with caution. Just don’t see one of the hands above and get over excited thinking you are holding the best hand in the world. Act rationally and logically and see the hand for what it really is, and the potential pitfalls it could lead you to and you should start to see an increase in your poker winnings, maybe not from extra money won, but more from money you do not lose, and of course money saved should be considered money earned!